Previously classified papers also reveal that the Conservative government of the 1980s considered a proposal from an influential backbencher to put the prisoners on a prison ship during the height of the hunger strikes -- and as they died, dispose of their bodies at sea. 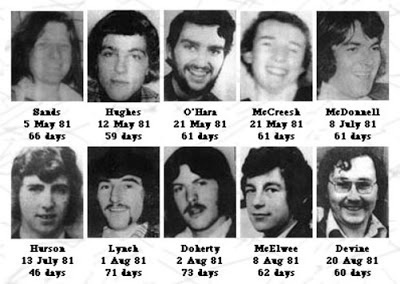 Ten republican prisoners, including Bobby Sands, died in their 1981 campaign against the criminalisation of the republican armed struggle. Official records have now revealed that the British government sought to use psychological strategies on prisoners to abandon their protest as they lay starving to death in the prison hospital. British officials hoped that by engineering a “capitulation” by one or more prisoners, the hunger strike would be thrown into disarray. They claimed that even if the plan later became public knowledge, it would be defensible because it would be seen to have prevented “pointless” deaths. In a memo circulated to colleagues on 1 June, 1981, senior Northern Ireland Office official R A Harrington recalled that SDLP MP John Hume had described the parents of Derry hunger striker, Kevin Lynch as “typical decent anti-IRA people” who would “do almost anything” to prevent their son’s death. Harrington said that in his view, “capitulation (i.e. a decision to take food) by one of the hunger strikers would be of enormous value to us, not just in itself but because of the great disarray into which the PIRA propaganda effort would be thrown”. It might be possible, he argued, to engage the Catholic Church, “possibly with the help of Bishop Philbin”, to bring further pressure to bear on the prisoner and his family. Another official said the “only obvious candidate for the brain washing would be assistant governor McCartney who visits the hospital regularly in the normal course of events,” he said. But there was a concern that the rapidly failing health of the hunger strikers made it difficult to implement the strategy. There were also proposals to feed the prisoners intravenously, which raised concerns because it would require drugging the prisoners. The protest ultimately ended on 3 October, 1981 after the families of some of the prisoners were allegedly encouraged by the prison chaplain to intervene to save the lives of their loved ones as they neared death. Another significant note confirms the British government was prepared to make the key concession of allowing the prisoners to wear their own clothing if the hunger strike was brought to an end. While the Thatcher administration’s public stance at the time was defiance of the prisoners’ five demands and a refusal to negotiate, one note form June 1981 indicated possible “adjustments” to the H-Block regime. “If the hunger strikes ended the government would be prepared to consider adjustments to the prison regime but the government would need strong evidence that the strike had ended before it could contemplate any adjustments,” the NIO (Northern Ireland Office) document said. The papers, released under the 30-year-rule, also show that the British government considered a bizarre suggestion to tip the bodies of Irish hunger strikers into the sea from a prison ship. The plan was mooted by former Home Secretary David Waddington before he was promoted to Margaret Thatcher’s cabinet. Prisons minister Michael Alison said the ship would cost more to run, need more staff and be less secure. He concluded the measure could only be justified as a temporary expedient in an emergency and was not a long-term solution.